Acapulco panoramic collage. Top, frae left tae richt: Acapulco Bay frae Chapel o Peace, Petroglyphs in Palma Sola, Nuestra Señora de la Soledad Cathedral, Mural bi Diego Rivera in Dolores Olmedo Hoose, San Diego Fort, La Quebrada, La Condesa Beach, Acapulco Dorado an Acapulco Diamante. 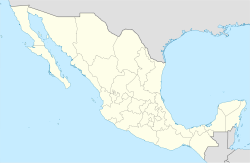 Acapulco (offeecially as Acapulco de Juárez) is a ceety, municipality an major sea port in the state o Guerrero on the Pacific coast o Mexico, 300 kilometres (190 mi) soothwast frae Mexico Ceety. Acapulco is locatit on a deep, semi-circular bay an haes been a port syne the early colonial period o Mexico's history. It is a port o caw for shippin an cruisin lines runnin atween Panama an San Francisco, Californie, Unitit States. The ceety o Acapulco is the lairgest in the state, far lairger than the state caipital Chilpancingo. Acapulco is Mexico's lairgest beach an balneario resortit ceety an aw. ↑ "History of API Acapulco". Acapulco, Guerrero: Administracion Portuaria Integral. Retrieved January 10, 2010. Wikimedia Commons haes media relatit tae Acapulco. This page wis last eeditit on 11 Mairch 2018, at 09:53.